I was introduced to William Brown's writing last fall when I read The Undertaker. I enjoyed it. Though the characters were stereotypical, the suspense was great. So when asked to read Amongst My Enemies I was excited. Unfortunately, I was a bit disappointed with the book. At first I thought it was going to be a like The Hunt for Red October, but then it morphed into a light romance that I thought might be more along the lines of 22 Britannia Road before hitting its stride as a Cold War Era spy novel. I have read a lot of books in this genre so my expectations might be a bit higher than the casual reader of this time period. Again, the characters were pretty stereotypical so not much was put into their descriptions. Unlike with The Undertaker, I was not able to connect with the characters at all. I didn't care if they lived or died. Even the plot was somewhat stereotypical of a cold war era spy novel. There were a few twists, but most were figured out way before the characters did. 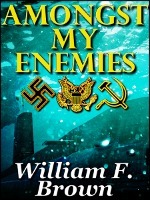 If you don't read a lot of of spy novels, then Amongst My Enemies would be a fun read and good introduction to the genre. While my heart rate was erratic while reading The Undertaker, my pulse never got above its resting rate while reading Amongst My Enemies.